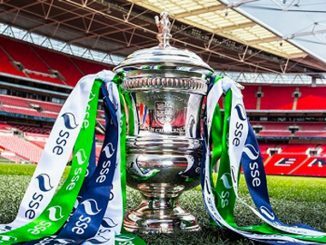 Alnwick Town, Bedworth United, Godalming Town, Harlow Town, Nettleham and Redditch United all eliminated FAWPL teams in the SSE WFA Cup 3rd Round qualifying. Northumberland League Alnwick Town spanned three divisions to knock out Rotherham United, with a brace by Jade Barrett, one each for Amy Hateley, Georgia Thompson and Mel Darling. Godalming Town of the Greater London Division 1 matched that scoreline against Premier League newcomers Haringey Borough, Toni West featuring with four goals and Becky Munro netting the other. East Midlands League Nettleham pulled off a fine 4-0 result away at Burton Albion. Leading with a penalty at half-time, they soon doubled the lead from 25 yards on their way to a memorable victory. 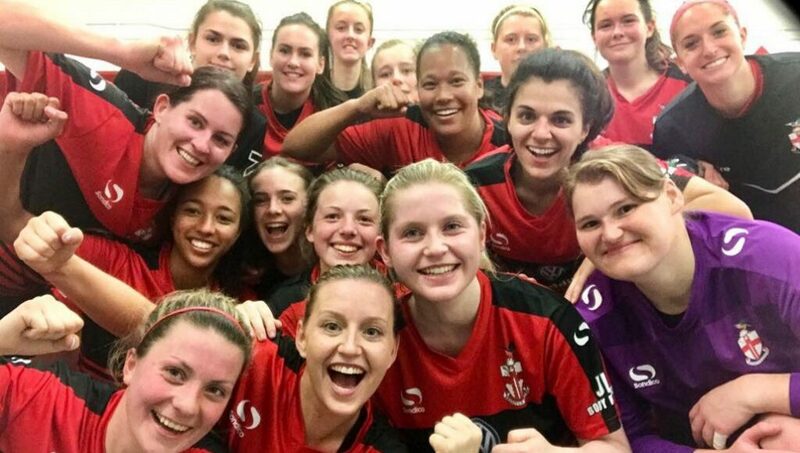 West Midlands League Redditch United dumped Solihull Moors out of the Cup, stunning the third-placed FAWPL Midlands Division outfit with a 5-2 scoreline. 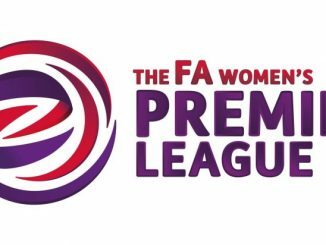 Eastern League Harlow Town accounted for established FAWPL side Denham United, Taylor Handscomb getting the goal after only 6 minutes. Another West Midlands team had a notable result, as Bedworth United accounted for Birmingham & West Midlands by to goals to one. There was nearly a seventh shock as South West League Torquay United took Brislington all the way to a shoot-out before going down 4-2 on penalties. TNS were also under threat from Shrewsbury Town after a surprise early goal by Tania Prior for the visitors but the Saints hit back with a Kim Bebbington brace and one from Emily Ridge. AFC Sudbury limited Enfield Town to just the one goal, scored by Stavroulla Panayiotou. Well over 500 fans were at Bramall Lane to see Sheffield United share six goals with Leeds United before winning 3-2 on penalties. Ashford Town (Middx) let slip a 4-1 interval advantage to London Kent Football United but recovered to win 6-4, with Alison Cheatley getting a treble. Charlotte Proud had a four-goal haul in Brighouse Town’s 6-1 win over Wakefield. Southampton Saints scored in the 1st minute at Cheltenham Town through Nicole Matthews and went on to win 4-1, with singles also from Libby O’Dell, Catherine Browning and Alisha Buckingham. 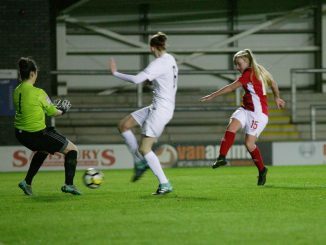 Nichole Goundry-Havery bagged both goals in a nine-minute spell straddling the interval, as Chester le Street beat Barnsley 2-1. with Abby Parkin scoring for the Tykes. Luton Town progressed at Maidenhead United, where Jess McKay got the only goal in the second half. Just a solitary goal too at St Nicholas, where Michelle Munro scored to see Keynsham Town into the next round. Steel City Wanderers fought back from 1-0 down at home to Morecambe to go through 2-1. MK Dons defeated Actonians 2-0, as Laura Mills added a late goal to Kerry Newman’s early effort. Hull City scored three second-half goals to win 4-1 at Crewe Alexandra, whose Leanne Derry netted in the first period only for Hope Knight to level right on half-time. Rebecca Beech got the second, Rachael Ackroyd buried a diving header and Katie Thompson scored at the death. 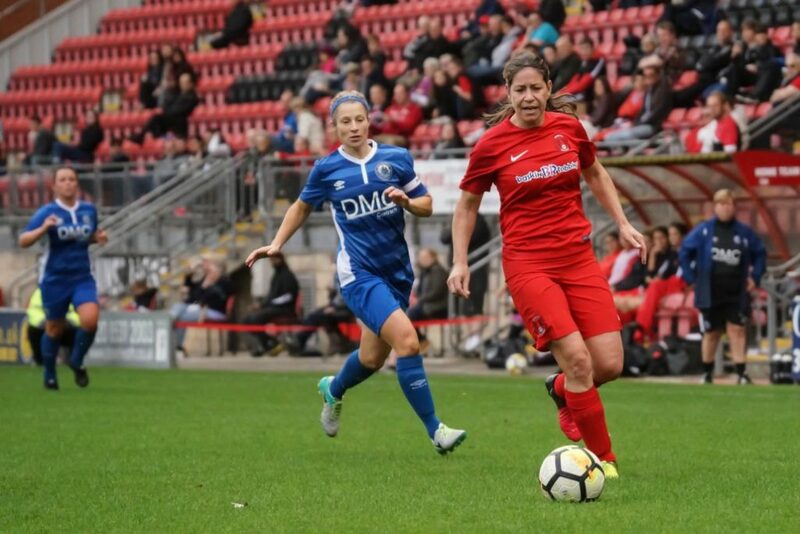 Gemma Tewkesbury and Faye Rolfe-Hawkins scored for Poole Town but visiting Plymouth Argyle went away 5-2 victors, aided again by a Tash Knapman hat-trick. Amy Pashley, Vicky Adams and Jade Arber got the goals as Long Eaton United eliminated Leicester City Ladies 3-1. Royston Town won by the odd goal in five at Bedford, where Frankie Smithers struck a 95th-minute decider. 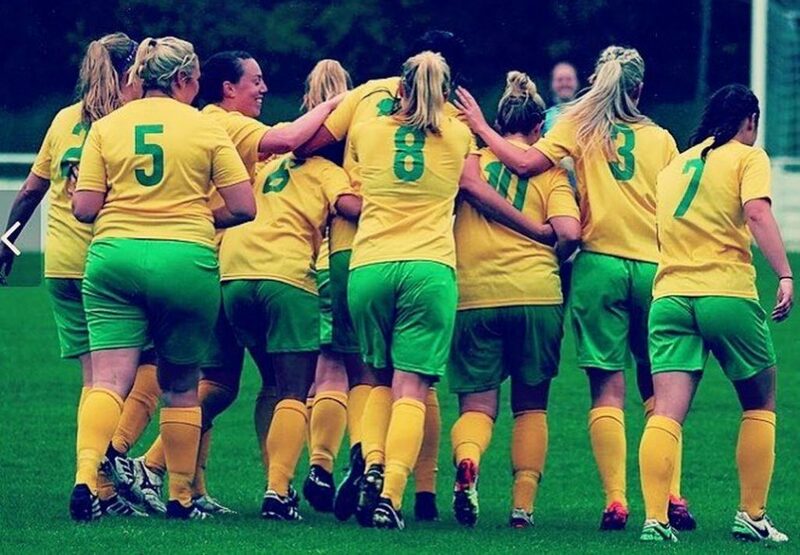 Eastwood overcame a 3-2 half-time deficit to defeat Coventry Sphinx 5-3, Chantelle Robinson scoring in either half. Acle United went two up at Peterborough Northern Star through Kirstie Kindred and Amber Rowland, the hosts replied but Megan Todd sealed the victory 5 minutes later. Chesham United fell behind in the second half to Whyteleafe but still bounced back to win 2-1. That was the same outcome at New London Lionesses but only after the extra half-hour, as Parkwood Rangers bowed out. Loughborough Students saw off Brereton Town, Frankie Murray, Ellie Betteridge, and Grace Pearson on target in a 3-0 result. Cambridge United posted a 4-0 winning margin over Norwich City, with two from Lauren Gibson, singles by Carolyn Sarafian and Nuala Wayne. Ipswich Town’s 5-1 win at Cambridge City was crowned by substitute Roxy Small netting an overhead kick with her first touch. Stevenage had seven separate scored in their 8-0 success Hassocks, where Amy Josland came off the bench to score twice and another subsitiute, Amy Makewell, also got on the scoresheet. Six players found the net for Southampton WFC at Winchester City Flyers, including sub Chelsie Hay. Newcastle United netted nine against Carlisle United, with Steph Ord top-scoring on three. Wymondham Town equaled that tally but with an unusual 9-2 extra-time score over Newmarket Town, with Laura Nicholls bagging four. Liverpool Feds’ 7-0 win over Mossley Hill included a Sasha Rowe hat-trick, as they eased into the 1st Round Proper. Top scorers though were AFC Wimbledon, who thrashed Woodley United 14-1, Caroline Bisson and Isi Asplund cashing in with three each. AFC Dunstable defeated Eastbourne Town 2-0, with Bethany Stanton and Charlotte South their scorers. Buckland Athletic beat hosts New Milton Town 4-1, where Laura Gough and Kirsty Caunter scored inside the first 5 minutes, the former going on to get a hat-trick. Forest Green Rovers’ unbeaten record was unable to sustain them against Larkhall Athletic, with the Premier League side going away 3-0 winners. Basingstoke Town came through successfully at FC Chippenham, with Lianne Hill getting a couple in the 6-1 win. Good to see ladies game getting deserved coverage! Nettles are going to Wembley . “sting em” nettles⚽? That 9-2 aet is an amazing scoreline. What on earth happened in extra time? Apparently, Wymondham suddenly got a bit clincal!